Andy Morgan (G86-91) and Charles Harrison (G83-89)are fed up with just talking to their many OF friends about some sort of year-group event, they've been doing this for ages - but that's all it's ever been, talk. Now they mean business. They're not sure what the event will be; karting followed by a meal somewhere is one suggestion, but it could be anything. They have no preconceptions, either, about location. What they'd like is lots of feedback from OFs who left between 1988 and 1992 (or, frankly anyone at all) and to make something happen before the end of this year. The more the merrier. Please let them know ASAP if you would be interested in getting involved, and with ideas and suggestions for the type of event and location. John Barker (Z90-95) and Alex Henney (Z90-95) are participating in the Polar Race in April 2007. The race is a 400 mile trek from the town of Resolute in Canada to the position of the magnetic North Pole as it was in 1996. We're currently training hard & putting on the neccessary fat reserves to keep us warm in the -50 degree centigrade temperatures. We are raising money for Cancer Research UK and Wooden Spoon (rugby's charity supporting mentally, physically and socially disadvantaged children and young people). 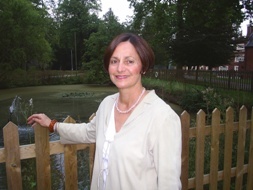 Paula Woolnough, who is married to Nigel Woolnough, Master of Brandeston Hall, has been appointed our first SOF Liaison Officer with the College. This is a vital role in strengthening the bond between the Society and the College, and in helping to persuade younger OFs of the value offered by involving themselves in the Society. Paula's direct involvement will prove invaluable. "I was delighted to be offered the newly created position of the "Old Framlinghamians Liaison Officer" and look forward to meeting as many OF’s as possible during the next year. The Old Framlinghamian diary is already a busy and interesting one but we hope to add more opportunities for communication, meeting up and visiting the two schools. So watch this space and do keep on checking the website which is regularly updated". James Ruddock-Broyd (G 46-52) has resurrected the old South-East Supper after a gap of many years. This will take place at The Peacock Inn at Piltdown (northwest of Uckfield) on Saturday 28th October, at 7 for 7.30pm. Dress code: a jacket and tie for the men. There are no particular instructions for ladies, who are always much brighter than chaps about such things. This is a supper for OFs and guests – and wives, husbands, partners etc. will be most welcome. For more information, and a link to The Peacock Inn's website, please see Events on the main menu. If you'd like an invitation form, please click here to Email James Ruddock-Broyd. The latest in the series of Burt-Wornham cricket matches was blessed with some wonderful weather making the prospect of a successful afternoon all the more probable. Team Burt won the toss and opted for team Wornham to take the crease for the eigth annual battle for sporting supremacy. It is with sadness to report the death of Len Evans, the renowned Australian wine guru. Len died suddenly of a heart attack while collecting a friend from hospital near his home in Australia. Len leaves his wife, Trish and his children, Sally, Jodie and Toby. Friends of the Evans family have reported that the funeral will be on September 16th but we have no official confirmation. "I was fortunate enough to have had lunch with Len when I arrived in Australia to live in 1991. He was a bloody fine chap. I went to his Pokolbin property and he gave us a tour of Rothbury Estate. It was a memorable occasion. To most, Len was the Australian wine industry, very well respected and admired. He said to me Australia have the best Shiraz in the world and France were starting to take note. He will be missed immensely. Lets all have a glass of wine for Len. Better make sure it is a Hunter Shiraz though!" The distant rumble of rifle fire which forms the musical accompaniment to the Summer for the residents of mid Surrey must have been mistaken for jungle drums. Whatever the source of the lure which landed a record number of OFs at Bisley’s Imperial Meeting this year, it was effective. John Melsom Hon OF who retired from Framlingham in 1980 after 32 years as biology master, housemaster, rugby coach, leader of the Young Farmers Club and participant in many other school activities, celebrates his 90th birthday on 4th August. He lives in a residential home in Yorkshire near to his son Richard (G 59-68) and enjoys the best wishes of all Framlinghamians who were privileged to be taught by him. The second Northern Gathering took place on 9 July at the home of Douglas Thomson (K 53-61) and his wife Dorothy. OF’s from Suffolk, Cambridgeshire and Lothian joined the ‘locals’ for a fine session of gastronomic indulgence and general bonhomie. Chris Essex, as the new editor of the Overseas Bag, has just published his first round-up of the latest news and views from Overseas OFs for Summer 2006 in the People section (click here to go to the People section or use the menu at the top of the page. You will need to be signed in to the website to access the Overseas Bag).